Known for its beautiful landscapes, safe neighborhoods, and one-of-a kind island lifestyle, Honolulu, Hawaii is the largest city of the island of Oahu and a major tourist attraction for visitors from around the world. Honolulu has breathtaking views of natural landmarks such as Diamond Head, Koko Head, and the great Pacific, as well as neighboring islands which are visible on clear days. Honolulu is known not only for its lush natural environment but also for its safe and vibrant communities making it a must-consider destination for home buyers and visitors alike. 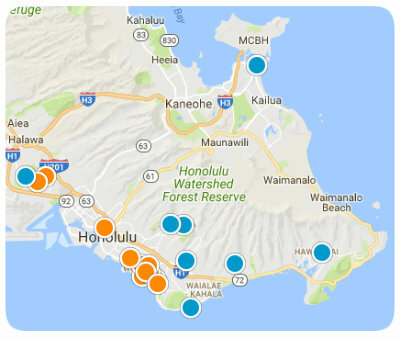 Ranked the second safest city in the United States, Honolulu encompasses many family-friendly neighborhoods and communities that provide for nearly 337,000 residents. Originally settled by ancient Polynesian migrants, Honolulu has grown rapidly due to American tourism and travel.This bustling city on Oahu’s south shore is not only beautiful but is brimming with unique and fun adventures. Known for its challenging hikes, beautiful snorkeling, and surfing, Honolulu has become the entertainment hub of Oahu. For residents of this city, many amenities and conveniences are easily available, including everyday necessities like shopping and dining. As each community within the city hosts its own shopping center, downtown Honolulu offers additional luxuries, such as gyms, movie theatres, museums, and professional services. Additionally, the area is home to over thirty schools and universities, meaning students have wonderful educational opportunities in Honolulu. Encompassing an area of nearly sixty square miles, Honolulu is brimming with unique real estate options, from high-rise condominiums to single-family homes and luxurious mansions. Home buyers also have a large variety of neighborhoods and communities from which to choose. There are oceanfront neighborhoods such as Kailua and Lanikai, or communities nestled in the ridge valleys, like Manoa and Palolo. Depending on the home buyer’s preference, there are living space options from under 550 to over 10,000 square feet. With such a diverse mix of homes, you will surely find the perfect dream home to suit your lifestyle. Special features include swimming pools, oceanfront properties, modern architecture, and high-rise apartment amenities. Home buyers from across the island of Oahu will find Honolulu as the perfect living destination, for its undeniable beauty, great real estate, and tropical paradise all year long. If you would like more information regarding homes for sale in Honolulu, Hawaii, please allow us to assist you and contact us today.